We found a black swallowtail caterpillar on the parsley today. Just the one. Last year we had six. We left two of them outside (they both died) and brought four inside (one died). So now we're kind of morally obligated to bring in any caterpillars we find and try to raise them. Duluth is on the northern edge of their range, and while the species is not by any means a rare butterfly, they're not super-common around here. And yet this is the second year I've found them on my parsley. I wonder if the species has some intergenerational memory where they return to the spot where their ancestors hatched to lay their own eggs. 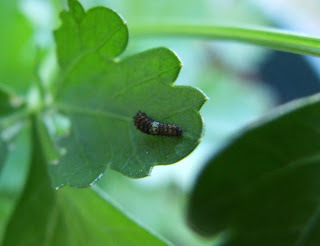 (Our butterflies last year would have laid eggs again after we released them, and those caterpillars would have overwintered as chrysalides and hatched the following spring, and then those butterflies would have laid the eggs that this new caterpillar hatched from.) Now I want to go poke around other people's gardens in town and see what I can find. One thing we have determined is that hatch date very likely corresponds with daylight hours. This one that we found today is maybe two days hatched... last year we found them as eggs, and they hatched on June 30. Last year's spring was dry and hot, and this year it was cold and rainy, so it can't be weather related. This one so far seems lively, and has been crawling around and eating a lot. She hasn't got a name yet (last year we had all girls, so, ya know, I'm just assuming.) There will be updates as events warrant.